Calculating pip value and choosing the correct Forex lot size when trading is very important. A simple mistake when selecting your Forex lot size can make a huge difference to your trading results. It would surprise you how many traders spend most of their time on entry signals. But this is just a small contributing factor towards a trader’s success. Having said that, many beginners do not have the required experience to come to recognize this yet. Money and risk management is the key, which begins with calculating pip value correctly and trading appropriate lot sizes. In this tutorial, you will learn the formula to calculate pip value. I will also show you some tools and features on the trading platform that will do it for you automatically. The pip value is dependent on the trading volume and the current rate of exchange. I will use the EURUSD for this example. When you trade one lot, you are trading 100,000 units of the base currency in the symbol. In this case, it is €100,000. So if you were to go long or buy this currency pair, you would be buying €100,000 by selling the USD equivalent at the ASK price. If the ASK price is 1.1200, you would be able to buy €100,000 with $112,000. Then by multiplying this by one pip and dividing the total by the current rate of exchange, you will know what the pip value is. The pip is the 4th decimal place for this currency pair and would be represented as 0.0001. The answers are easy to remember and this is what you should take away from the calculations. One standard lot is 100,000 units of the base currency and the value of a pip is $10. One mini lot is 10,000 units of the base currency and the value of a pip is $1. One micro lot is 1,000 units of the base currency and the value of a pip is $0.10. Notice the pattern, each is 1/10th of the preceding lot size. These volumes would be categorized as 1.00, 0.10 and 0.01 for a standard, mini and micro lot respectively. When you are selecting how many lots to trade on the platform, you can select 1.00 for one standard lot, 0.10 for one mini lot and 0.01 for one micro lot. You can also trade in combinations of these. A volume of 1.53 would be an amount to trade of €153,000 and the pip value will be $15.30. The image below shows the trade panel from the MT4 platform. The trade size selected is 3 micro lots (0.03) or €3,000. Calculating the pip value for this forex lot size is easy because we already know it is €0.27 or $0.30. After clicking buy or sell, a €3,000 deal would be executed where the potential exists to profit or lose €0.27 or $0.30 per pip. The calculation is slightly different for currency pairs that include the Japanese Yen. For currency pairs that include the Japanese yen, the pip is in the 2nd decimal place so this part of the equation would change. Instead of using 0.0001, you would use 0.01. A Forex lot size that is too small can minimize your potential to profit on trade ideas that work out. Trading lot sizes that are too large relative to the size of your account may jeopardize your balance. These can be easily avoided by deciding ahead of time how much you are prepared to risk on a single trade idea. Then by taking in to account how far your stop loss will be placed from the entry or buy price. How much to risk per trade is up to you but most traders agree that this should be a small percentage of your balance. You should also take in to account your trading performance, tolerance to risk and comfort levels. We will go in to this in more detail in later tutorials. When trading, you should not be making these calculations every time you execute a deal. This is time consuming and may cause you to miss optimal trade entries in to the market when opportunities present themselves. There are tools available to quickly and conveniently tell you what the value of a pip is. All you will have to do is check and possibly make a slight adjustment before execution. Once you gain a little trading experience and proficiency, you will know roughly what forex lot size you should be trading and the value of the pip from memory. These can easily be found online. Some trading platforms even have them built in. cTrader is one trading platform that calculates the pip value for you. If you are trading on this platform, a pop up window will appear whenever you place your mouse cursor over the lot size field. When you change the lot size to trade, information about your deal will let you know what the pip value is. 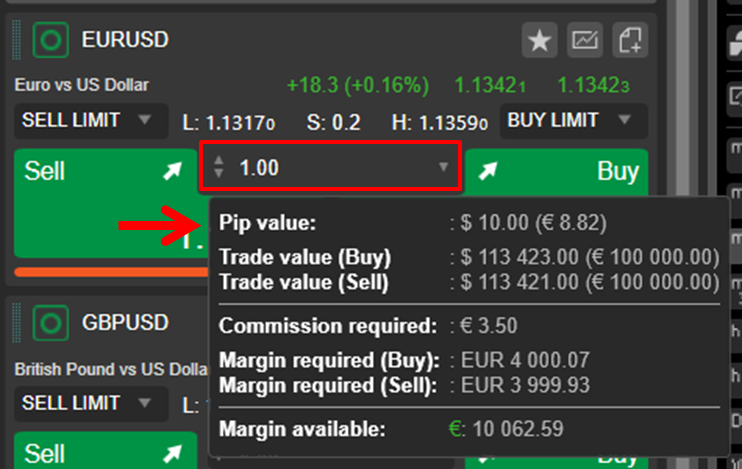 In the image below, cTrader lets us know that a lot size of 1.00 has a pip value of $10.00 for the EURUSD currency pair. It also tells us the equivalent amount in terms of your accounts base currency. The MT4 and MT5 trading platforms do not calculate pip value by default. However, you can download a script from the market place that will plug in to the platform and add this feature. You can access the market place of scripts and indicators from a tab in the trade terminal at the bottom of the trading platform. A simple search for pip value or pip value calculator will retrieve the relevant scripts that you can download. The formula is simply how many pips you managed to capture multiplied by the pip value. So if the pip value is $10 and you manage to capture 50 pips on your deal, then you have made $500. The calculation is the same for calculating potential pip value based on your projections or profit targets for your deals. To calculate profit from pips is very easy once you know what the pip value is. We must also consider your accounts base currency if it is denominated in another currency other than USD. Using the same symbol (EURUSD) in the example above; if your accounts base currency is in Swiss Franc’s (CHF) then the pip value in USD would be converted at the current USDCHF exchange rate to derive the value of it. If it was in Australian Dollars, the pip value in USD would be converted at the current USDAUD exchange rate. Your profit and loss is calculated in real time, in terms of your accounts base currency by default. TIP: To invert the exchange rate from AUDUSD to USDAUD, simply divide one by the AUDUSD exchange rate. The formula is the same as above however you will just replace the number of pips captured with the number of pips lost or the number of pips you are willing to risk. Losses and losing trades are unfortunately an inevitable part of forex trading. Every business has to account for losses or waste, so nothing is different here. They should just be minimized and managed as best possible. You have decided to risk $100 on a trade idea and have determined that you are willing to allow up to 100 pips of adverse price movement before accepting the loss. (Amount to risk) / (stop loss distance in pips) = Pip value. Calculating pip value in this scenario is easy; you can’t trade more than $1 per pip so you would select the appropriate lot size to trade depending on the currency pair you are trading. This can be quickly done by selecting a lot size of 0.1, then depending on the currency pair trading, make adjustments until the pip value calculator reflects the desired value of a pip. When you know the pip value, you can select the appropriate lot size to not exceed your amount to risk based on your stop loss placement. You can of course trade larger deal sizes with the same amount to risk, however the distance of your stop loss will have to be closer to your buy or entry price. For instance, you could trade $2 per pip and place your stop loss 50 pips away. In effect, you have doubled your deal size but the amount at risk has remained the same at $100. By rearranging the variables in this equation, you can calculate any unknown variable from any two know variables. Let’s say you want to trade with a pip value of $2.50 and you don’t want to risk more than $100 on the deal. Dividing the amount to risk by the pip value will give you the stop loss distance in pips for the deal to not exceed the total amount at risk for the trade. In this case, $100 divided by $2.50 is equal to a 40 pip stop loss. Although it is not difficult calculating pip value, remember that it is not necessary to do so every time you trade. Trading platforms have a lot size calculator built in and you can easily find them online to help you.